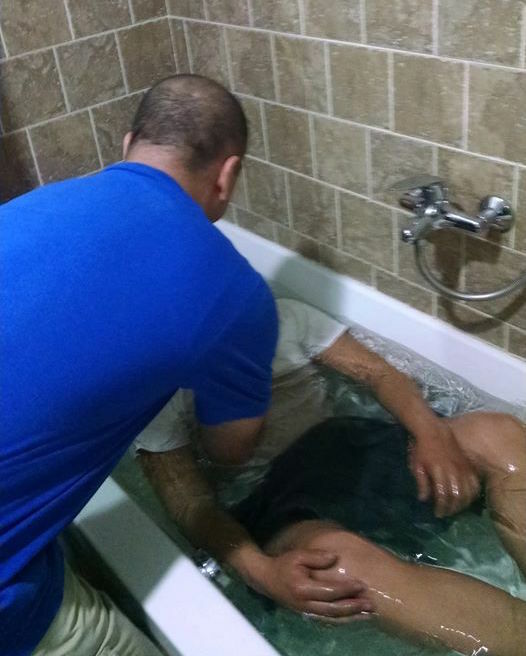 ULAAN BAATAR, Mongolia (BNC) — The Mission Mongolia 2015 effort registered its first baptism Monday, 9.45 a.m., local time. A young man named Munkhtur was baptized in the bathtub of the hotel room, according to one report. This result followed a first-time Sunday worship meeting Apr. 19. Thirty-six Mongolians and a team of 7 Americans met for worship. “It was a blessed first meeting. There are seekers here. We must continue to pray for fruit and a permanent establishment of the Lord’s church,” Tom Langley, World English Institute president, said. The effort was made possible by working with WEI, according to KTTR supporter Jamie Suiter. WEI has about 5,000 Internet students in Ulaan Baatar. Approximately 75 of the 120 who had registered with the WEI for this effort picked someone with the mission team to study with, Jamie said. WEI students learn English by studying the Bible. The team will preach and teach for two weeks in the capital and continue the work by Skype when they return. There are no known congregations in Mongolia that adhere to New Testament teaching. Tom was working with WEI in China, and from there got a lead into Mongolia. Most of the team left Denver on April 16: Bill Stewart from Firestone, Colo., Luis Camacho from Sulphur Springs, Tex., Adam Dollen from Golden, Colo., Chance Abston from Golden, Colo., and Gary Aragon from Pueblo, Colo. They joined Michael O’Brien from Wuhon, China, and Tom Langley in Mongolia. Bill Stuart is Development Director at Bear Valley Institute of Biblical Studies. “They hope to plant an extension school in Mongolia after the church is planted so they can train their own people to reach out in other areas,” Jamie said. A thousand World Video Bible School DVDs were taken to be distributed as well. The Mongolia 2015 effort has a Facebook page that provides updates of the effort. Update: Bill Stewart reported that four more baptisms occurred Tuesday afternoon, local time. This is so wonderful. Two of my WEI Muslim convert families in Afganistan are of Mongolian descent (they are Hazarats). One of the families had to flee for awhile. If it happens again, there is now some place they can go with brotherws and sisters who will welcome them and with whom they can be of mutual encouragement. God bless everyone involved in this wonderful effort. People like this are my heroes. Tom Langley (WEI President) is a dear brother and co-laborer in Kingdom work. I am a fellow minister on staff with the Maryville Church of Christ in Maryville TN. As he shared his impending trip with our congregation, we were so happy to hear of this great opportunity. We all pray blessings on those who are sharing the gospel and, most certainly, on those whose hearts God is preparing to hear it. May His Name be powerfully proclaimed and received. Grace and wisdom to all those involved in this work!